NVIDIA Corporation (NASDAQ: NVDA) is holding its GPU tech conference through Thursday, and CEO Jensen Huang delivered the keynote Monday. The chipmaker reported a fourth-quarter revenue drop Feb. 14 and announced the .9-billion purchase of Mellanox Technologies, Ltd. (NASDAQ: MLNX) on March 11. Bank of America Merrill Lynch analyst Vivek Arya maintained a Buy rating on Nvidia with a $193 price target. Raymond James analyst Chris Caso maintained an Outperform rating. UBS analyst Timothy Arcuri maintained a Buy rating and $180 price target. 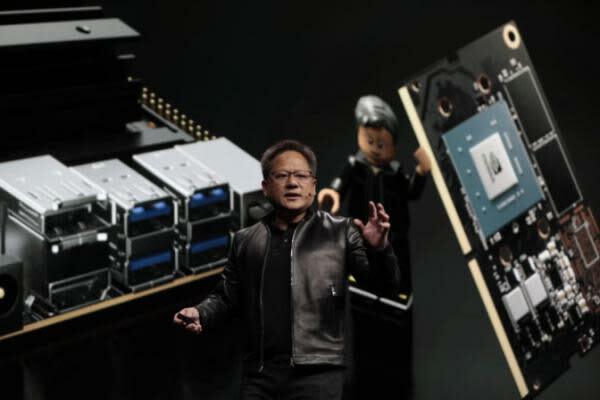 Huang's keynote address focused on the latest advances within the three chapters of Nvidia's "uniquely leverageable" graphics platform, Arya said: computer graphics; artificial intelligence and high-performance computing; and robotics. Nvidia's CUDA-X AI data science server initiative has been adopted by Amazon.com, Inc. (NASDAQ: AMZN) Web Services, Alphabet Inc (NASDAQ: GOOGL) (NASDAQ: GOOG) Cloud, Microsoft Corporation (NASDAQ: MSFT) Azure and by several enterprises, the analyst said. The company also announced new T4 inferencing servers in partnership with the world's top server makers, Arya said. The analyst said he believes the new data science workstation will accelerate predictive analysis. On self-driving technology, BofA noted that Nvidia announced the DRIVE AV platform, which helps predict what other drivers will do to intelligently avoid collisions, and also a deeper collaboration with Toyota Motor Corp (NYSE: TM). Among the noteworthy product announcements were Nvidia's RTX Server, which addresses rendering farms, collaborative computing and cloud computing; AWS G4 instances; and the Toyota partnership, which was expanded to include "Drive Constellation," Nvidia's end-to-end simulator for self-driving cars, Caso said in a Monday note. "The company made a number of incremental announcements, but we would consider these to be evolutionary, rather than game-changing announcements," the analyst said. One common theme that underlined the slew of GTC announcements was Nvidia's aggressive efforts to be a platform vendor rather than a mere chip vendor, Arcuri said in a Tuesday note. Although Nvidia is now sticking to its traditional GPU knitting, it is leveraging its software stack to address the specific needs of verticals beyond traditional HPC/hyperscale, the analyst said. "Ultimately, we think that these software stacks help NVDA to continue solidifying new ecosystems from graphics to DC/HPC to autonomous driving/automation, all of which bolster its competitive moat." As the company looks to converge gaming and data center roadmaps, UBS said Nvidia is further expanding GeForce Now, an open platform in the cloud. The research firm also noted partnerships with telcos that could use the RTX Pod to stream games over 5G. Nvidia shares were advancing 3.88 percent to $175.51 at the time of publication Tuesday. Related Link: What's Next For Nvidia And Mellanox? Nvidia CEO Jensen Huang at the GPU Technology Conference. Photo courtesy of Nvidia.